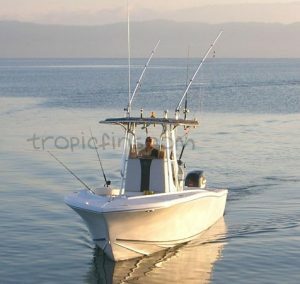 This custom-built 27ft Ocean Runner enter console fitted with twin 175hp Suzukis fishes out of Puerto Jimenez. Canadian Captain Cory Craig, specializing in inshore fishing, is at the helm, assisted by an English-speaking mate. She is equipped with Simrad 10″ sounder/GPS, VHF radio, Sony stereo, a head (toilet) inside the console, outriggers, Cannon electric downriggers, center rigger, 70 gallons of live well space (20 gal in transom, 50 gal in deck well), and carries Shimano rods (Tallus, Talavera and Trevala), Shimano reels (Tiagra, Tyrnos, Torium, Spheros and Saragossa), Eagle Claw hooks, Gamma leaders, Temple Fork fly rods and reels, Aftco fighting harness, Aftco kite and an abundant array of lures. The boat will also pick up in Golfito.